Charleston’s historic East Bay Street was once lined with more than two dozen large wharves, where tall-masted sailing ships once loaded large cargoes of rice and cotton. The very first wharves where made by tying together palmetto logs, floating them off the bank and sinking them in the mud at low tide, then bridging the distance with stones, tree limbs and even animal carcasses. Not surprisingly, the first such docks were called “bridges”, and in colonial-era maps, there are numerous bridges protruding out into the Cooper River. Over time, the docks got wharf names and were built bigger and wider to accommodate warehouses and shipping offices. The picture is a rare glimpse at the famous Southern Wharf, which was busy until after the War Between the States, when commerce declined and the ships disappeared. This shot is the wharf in ruins shortly after the Cyclone of 1885, which wrecked an already-dilapidated area. Today, the old wharf is home to the Carolina Yacht Club, whose buildings include cotton brokers offices visible in the 1885 picture. 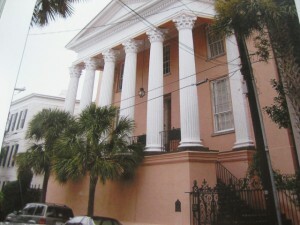 The original High School of Charleston opened in this building at 55 Society Street in 1841. Designed by famed Charleston architect Edward Brickell White, it is a Classic Revival structure that features a portico facade of six massive Corinthian columns on a high raised basement. This was part of the city’s rebuilding program in the Ansonborough area after the fire of 1838, and included “fire loans” to citizens who rebuilt in brick, or brick and stucco such as this building. Students who attended studied Latin, Greek, English Composition, Algebra, and Biology, as well as Chronology and Mammology. The fortunes of the neighborhood suffered after the War Between the States, and the area declined into a slum. The high school was relocated to George Street in 1881, and the old building fell into disrepair, and was used as a VFW post in the early 20th century. Ansonborough made a comeback in the 60’s and 70’s, and in 1984, the old school was beautifully restored into condominiums.